Designed to reward everyday purchases, the Citi Rewards+ Student Card is a great choice for first-time cardholders wanting to earn points on small purchases. Plus, a bonus category on gas and supermarket purchases makes it easy to rack up points on all your errands. However, a higher than average APR and steep penalty APR make it expensive to carry a balance on this card. You’ll need to pay off your balance in full each month to avoid racking up interest charges. At first glance, the Citi Rewards+ Student card doesn’t seem to have the best rewards rate. 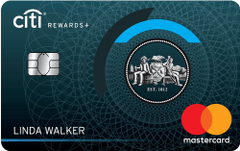 The card offers 2 ThankYou points per dollar on gas and supermarket purchases (on up to $6,000 in purchases per year, then 1 ThankYou point per dollar). The Wells Fargo Cash Back College Visa, for example, offers 3 percent cash back on similar bonus categories. However, other unique features on the card help boost the overall rewards earning potential. The most lucrative perk on the Citi Rewards+ Student Card is the round up feature, which rounds up ThankYou points earned on every purchase to the nearest 10. That means a $3 cup of coffee will earn you 10 points or a $12 t-shirt will earn 20 points. This feature drastically increases the rewards value of the card and makes it a great choice for everyday spending. For students who make a lot of small purchases – such as lunch, morning coffee or even school supplies – the Citi Rewards+ Student Card has the potential for great rewards. The Citi Rewards+ Student Card earns flexible ThankYou points, which can be redeemed for gift cards, merchandise and travel purchases. Cardholders can also use their points to shop online at Amazon.com or BestBuy.com, a big perk for students needing new computer equipment or dorm room supplies. Unlike many student cards, the Citi Rewards+ Student Card comes with an intro bonus of 2,500 ThankYou points after spending $500 in the first three months. This is redeemable for $25 in gift cards. The Citi Rewards+ Student Card also comes with a 0 percent introductory APR on new purchases for the first seven months (16.74-26.74% variable APR thereafter). This is an appealing offer for new cardholders, who can learn good payment habits without incurring hefty interest fees for the first few months. However, it is not the longest intro APR you’ll find, and it doesn’t cover balance transfers. After the introductory period, the APR on the Citi Rewards+ Student Card is on the high side. Cardholders who qualify for the low end of the range are offered a 16.74 percent APR, which is not bad for a student card. The high end however clocks in at 26.74 percent. Because of this, carrying a balance on this card can be costly. In addition, the Citi Rewards+ Student Card charges a penalty APR up to 29.99 percent if you make a late payment or your payment is returned. As an additional perk, the Citi Rewards+ Student Card also comes with Citi Private Pass. This gives cardholders exclusive access to presale tickets to concerts, sporting events and more. Why get the Citi Rewards+ Student Card? You are looking for a first credit card that rewards your everyday spending. You make a lot of small purchases – such as lunch, coffee or movie tickets – and can take advantage of the round up feature. You don’t want to keep track of rotating bonus categories. Uses the card for all your day-to-day transactions (especially small purchases like your morning coffee) to boost your rewards rate with the round up feature. Redeem your ThankYou points often to receive 10 percent back on up to 100,000 points a year. Use the card on gas and grocery purchases to take advantage of the bonus category. Pay off your balance in full each month to avoid hefty interest charges.